Red Golf Square Umbrella - Umbrella Heaven, 1000+ umbrellas! These really are top quality Fashion Umbrellas. 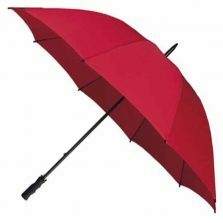 With a canopy width of 89 cm (35″), our stylish red golf square umbrella takes fashion umbrellas to another level. 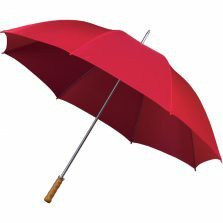 Looking for a red golf square umbrella? A totally square fashion umbrellas? Our brand new Square Long Umbrellas are available in a choice of popular colours. Approximately 102 cm (40″) from top to toe and the latest addition to our range of Fashion Umbrellas – these exciting Square Umbrellas are totally windproof because they are constructed with a modern, flexible fibreglass frame. They’re lightweight too. These extremely popular and highly fashionable Square Umbrellas have a strong square profile shaft, square handle and square tip to match the square canopy. The clean and crisp contours of these colourful fashion umbrellas will compliment virtually any outfit (particularly a red one…) and make a great addition to your wardrobe. Go ahead, be different! 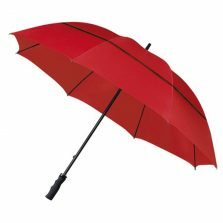 You are sure to look absolutely great with a new-look Red Golf Square Umbrella! Not the one for you? 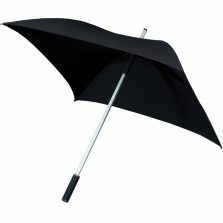 Check out the rest of our range of quality square umbrellas!